Nobody's called the Sears department store chain by its original name of Sears, Roebuck and Co. in decades, but somebody forgot to tell the managers of the monolithic branch of the chain on Bedford Avenue in the Flatbush neighborhood of Brooklyn. There it is in monstrous letters high above the street. Alvah Roebuck lives! The full name is also seen carved above various entrances and on metal plaques about the structure. Whoever decided to keep the sign as is is all right in my book. It's a nice historical reminder. And thank got the company's ugly new logo wasn't stuck up on top of that beautiful Art Moderne tower. Looking at the building I thought to myself, "Geez, I haven't been inside a Sears in years. I wonder what they're like these days." I entered and found out: they're like K-Mart! Sadly, there were no more reminders of the building more glorious past inside; just the usual personality-free division of departments. No adornment whatsoever. So I threw out the ol' holiday wreath yesterday, took it off the door, spangles and pine cones and all, and tossed it on the curb for pick-up. This morning, I find the wreath still there but absolutely stripped of all its adornments: the bows, fake-frosted cones, baubles and bells—all that crap they put on wreaths these days. What's going on, here? This wasn't silk ribbon. That wasn't real holly or bells that actually ring. It was all fake, plastic and paper junk. Who wants this stuff? Who collects it? 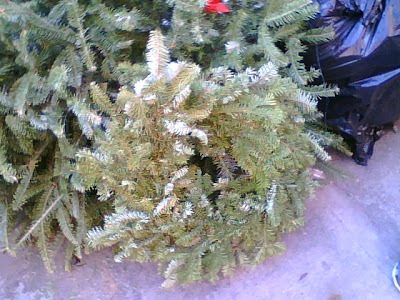 Are there people who go around the neighborhood looking for loaded wreathes they can shear of goodies? Is there a wreath chop shop network somewhere? Will I find those same decorations recycled on the wreath I buy next year? A mystery. Isn't he a pretty picture of contentment, sunning himself on the permanently open fourth-floor window of this 19th-century brick walk-up on Kane Street in Cobble Hill? Vermin apparently have such complete run of the abandoned, bedraggled spectacle that is 149 Kane Street that they don't mind sunbathing out in the open, as if to state to the world, "I have no fear of reprisal or extermination. I run this place!" The building is the one eyesore of the elegant block between Henry and Hicks. The roof is sagging, the stoop and facade are cracked, the cornice is loose and hanging, some windows are boarded over while others are open. A very angry old lady who lives next door, and has signed many a petition over the years, told me the owner of the horror bought it 20 years ago "for a song," and has done nothing with it ever since. She said the roof leaks constantly. A little rain, however, never bothered our fat friend, the suntanned rat. UPDATE (1/2/2007): This item has since been picked up by Brownstowner, Curbed and New York Magazine, to which sites I am gratefull. I no longer care whether it's a rat, squirrel, small dog or armadillo. I just want that that building saved from the clutches of its absent landlord. The charm of this sign is its almost homemade quality, and the number of letters that have fallen off it or faded from view. You really have to take a moment to piece together the various components. It's also the only sign I've ever seen that saw fit to abbreviate "window" as "w'dow." The store is on Fifth in Park Slope. Took down the tree and the ornaments today. Sigh. I went to the Donuts Coffee Shop in Park Slope to grab one more cheap breakfast before it disappeared into collective civic memory. And it's a good thing I knew where to go, because there was no sign. 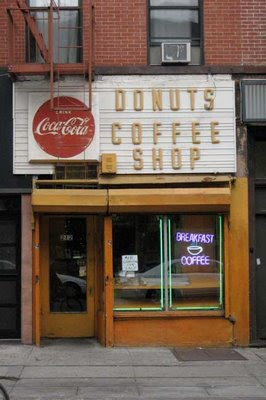 The classic corrugated signage which read "Donuts Coffee Shop" had been taken down and all that was left was the broad white background. The woman behind the counter said someone had bought it and taken it down the previous day. There was a good crowd inside. About three-quarters of the stools were occupied. A photographer from Brooklyn Paper was there clicking away. A few donuts remained in the racks. I asked for a plain and a coffee ($1.50). The man next to me, apparently aware that this was his last chance to eat at the shop, consumed a full plate of pancakes, and scrambled eggs and bacon. His friends were impressed. The counter woman said the old, framed plastic signs above the counter listing the menu items and their prices would remain, to be disposed of as the encroaching Associated Food next door saw fit. Too bad, I thought. She continued to clean during every spare minute, not wanted to leave a dirty shop behind her, I suppose. A man came in for his regular coffee and left a two-dollar tip. "You deserve it." Then a gnomish old man came in with a gift bag, which he presented to the woman. Inside were framed photos of the Donuts Coffee Shop letters coming down. This was the man who had taken the sign. "What did you do with it?" I asked. "I took it home," he said. "It's in my apartment." I, too, was overcome with the urge to leave with a bit of the shop. I asked if they were willing to part with the plastic sign which listed the donut prices. The woman smiled and shrugged her shoulders. "You want it?" I offered some money for the sign, but they just unscrewed the single screw that held the sign up and gave it to me. I then said goodbye. Walking home I became aware of a pungent smell the sign was giving off. Thirty years of diner grease. 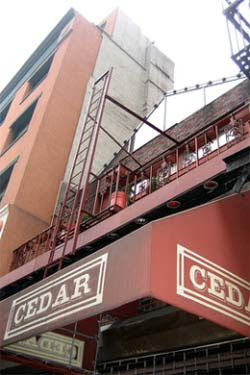 The Cedar Tavern is no more. 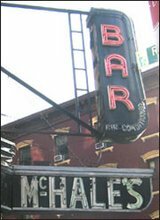 Gothamist has quoted owner Michael Diliberto as saying the place, closed since Thanksgiving 2006, will not open again. Instead is will make way for the scourge of our times: condos. Diliberto lost his co-owner and brother, Joe Diliberto, two months ago, and doesn't wish to soldier on alone. Joe succumbed to cancer. Oh, as to the name: the tavern was originally opened back in 1866 on Cedar Street way downtown. A 141-year-old saloon, gone for good. Think about that. How many of those can be left in America? Excuse me—I want to alone for a while. 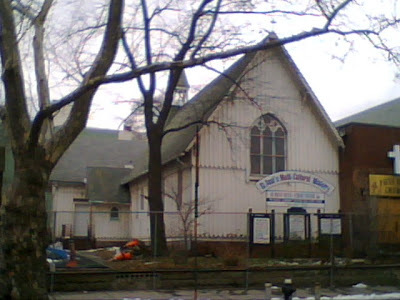 Only a few days ago I wrote about Woodside's neglected St. Paul's Episcopal Church, crying out for someone to pay attention to the 1874 wooden structure, an un-landmarked jewel that was fast heading toward oblivion. Well, politicians and developers won't have to lose any sleep on how they can circumvent preservationists on this one. 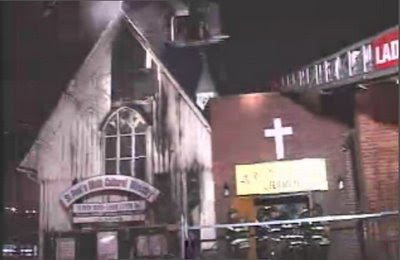 A fire tore through the structure last night, destroying the irreplaceable stained glass window and other parts of the church. No people were harmed and the cause of the fire is under investigation. See it before (above) and after (below, courtesy of Queens Crap). Another loss for poor respect-starved Queens. Sometimes inaction is as good as demolition when it comes to landmarks. Curbed has posted the first glimpse in some time into the interior of the Chumley's, the landmark speakeasy that fell to grief last April. It's a sad sight. This is all that could be accomplished in eight months time? It's hard to tell much from this shot, but one can at least perceive the arch which separated the dining room from the bar area, and the area where the brick fireplace used to be. 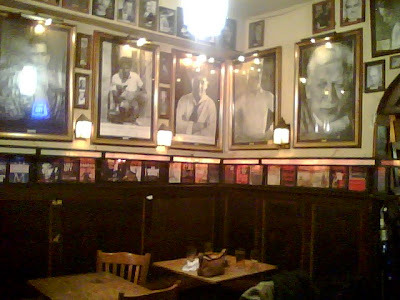 What I want to know is: where are the countless framed book jackets that lined the walls just above the booths, and the many framed photographs of the authors who wrote those books and frequently the tavern? Where are they being kept? Are they safe? Or where they destroyed beyond repair when the wall collapsed? 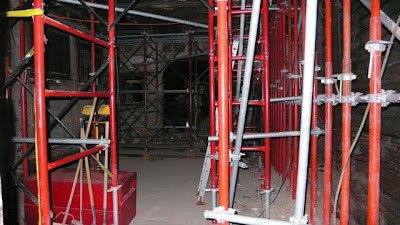 Those artifacts, after all, were a great part of what made Chumley's special and historical. And who's got the freakin' wooden phonebooth!? 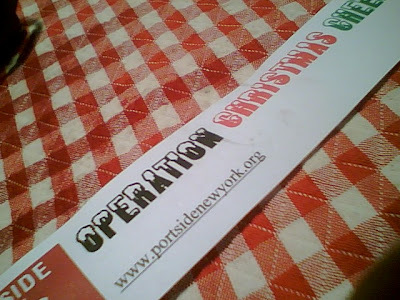 As I blogged a couple days back, I helped the PortSide NewYork folks in their annual task of culling and wrapping Christmas cookies to deliver to New York Harbor sailors who must work on the yuletide. Looks like Operation Christmas Cheer went smoothly, if photos over at the blog Tugster are any judge. Good job, crew. For weeks now, I've passed by on classic little Donuts Coffee Shop on Fifth Avenue in Park Slope, eyed its closed shutter and wondered. Was it the end of the line for the timeworn Coca-Cola sign and the long, narrow shotgun counter? I lied to myself that all was well. The place had always kept odd hours, hadn't it? And if it had lasted this long, it would surely persevere, right? Sorry, Charlie. The place will bite the dust on Friday. No ravenous developer is to blame. No condo tower will go up. It's just that the Associated supermarket next door is hungry for space, and will gobble up the miniature storefront. Twelve red circular stools has the Greek diner. The donuts racks behind the counter are classics of utility. Bottles of ketchup, bottles of mustard, shakers of sugar. Amazingly low prices, posted on signs up high behind the counter. The sign just says "Donuts Coffee Shop." I have to think the owners just wanted to advertise that they sold donuts in their coffee shop. 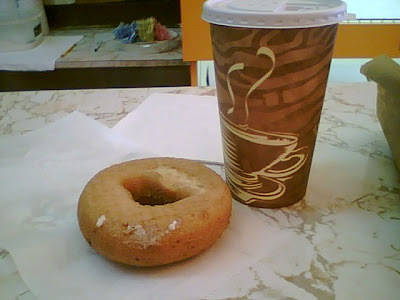 But everyone now assumed the place is actually called Donut Coffee Shop. (Thanks for Brooklynometry for the picture.) 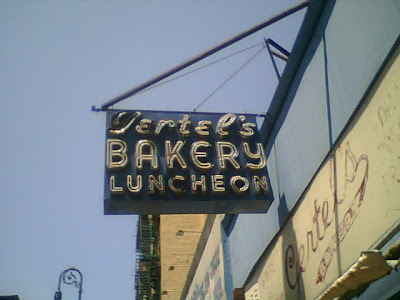 The building's been there more than one hundred years, and for most of that time its been a bakery of some sort. But, apparently it was a movie house sometime in the 1920s, according to the Department of Building. Will anyone save the sign? This sort of signage is not long for the word. An example of its kind leaves our world every day. An ongoing crime is taking place at the Queens corner of 61st Street and 39th Avenue, and has been for years upon years now. On that corner sits the remnants of a beautiful old Gothic Revival wooden church. It's a lovely building, quaint and endearing, but you wouldn't know it by passing by, as so many people do without looking. That's because St. Paul's Episcopal Church, as it's known, has fallen to near ruin. The white paint job has grown dingy over time. In fact, the whole grounds, surrounding by an inappropriate chain-link fence, is in need of a bath. The lawn is badly tended and strewn with neglected plastic children's play things. Naturally, since this is Queens, it has not been landmarked. It ought to be. And it ought to be cleaned up, for Christ's sake. One of the central leitmotifs of Christmas is good will toward men and helping out your fellow beings, but, in the rush to ensure one's own good time, it's seldom acted upon these days. One person who remembers to put others first is Carolina Salguero. 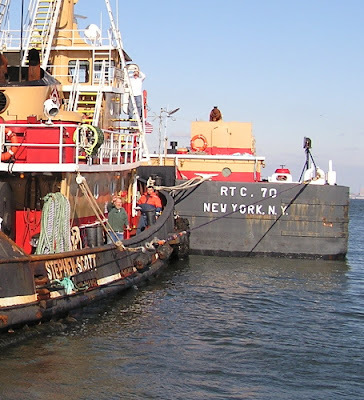 For the past four years, Salguero, owner of the tanker Mary Whalen, waterfront activist, founder of PortSide NewYork and all-around Red Hook fixture, has been spearheading Operation Christmas Cheer, in which she and a small crew deliver newspapers and plates of Christmas cookies to seamen on tugs and barges who are forced to work on Christmas Day. I loved the sound of the enterprise when I first read about it in the New York Times in December 2005, so when Christmas 2006 came around, I volunteered to help. Since my family wouldn't have been too pleased if I took off Christmas Day to sail around the harbor, I offered instead to bake cookies. 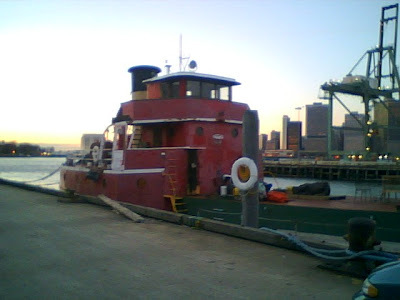 My wife, son and I then boarded the Mary Whalen, which is moored in the Red Hook containerport, one the north side of Pier 9B, and helped Carolina wrap up the cookie plates. We did the same this year. I beefed up the cookie allotment this time; last year I hadn't realized how many big, hungry sailors there were to feed. I came on board armed with about ten or twelve dozen. The snug galley is the place of operations. An enormous cast iron stove, counters and portholes surround a semi-circular table. 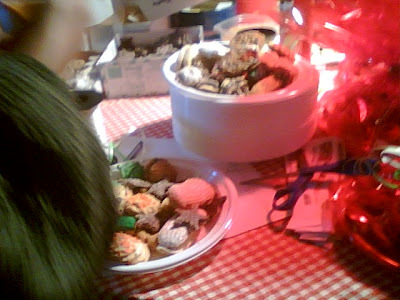 Boxes upon boxes of cookies were piled high; Carolina gets contributions from many of the local bakeries at this point, included Margaret Palca. Her efforts have become well known among the seamen and they now look forward to a visit from her and her Santa-hatted helpers. She was due to go out with a crew of eight this year. Carolina's mother, a warm, friendly woman from Martha's Vineyard, was on hand this year, and planned to sail on Christmas Day. We all divided duties between curring swathes of red cellophane, filling up plates with cookies, tying the packages with ribbon and attaching Operation Christmas Cheer tags. Hot cider was on offer, and holiday tunes played on a boombox. In good time, we had 22 plates set and done. Carolina then drove us back to the gate of the shipyard in the back of her pick-up, with us singing jingle bells as we went. It wasn't a horse-drawn open sleigh, but the spirit was the same. 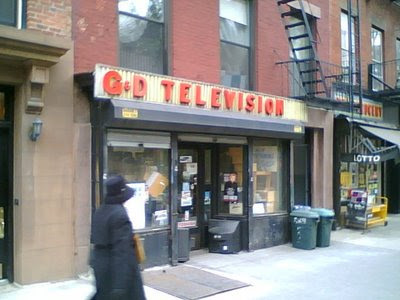 Back on January 27, I posted an item about G&D Television Repair, a little shop on Henry near Atlantic, observing that it was a sort of business that you won't see in ten years time, given our throwaway society. Did I say ten years? Make that one year. Gowanus Lounge reports that the tiny store is gone. So don't even thing of repairing that TV now; just go buy a new one, like everyone else. Anybody know how long that place was there? And who was "G"? Who was "D"? Trusting Tailoring and Cleaning, a Cobble Hill business with one of the best names in history, may be on its way to extinction. 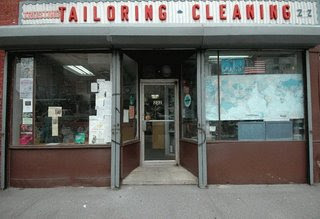 According to a petition begin circulated around the nabe, the new landlords have jacked up the rent to the rafters, and the Oh family, which owns the dry cleaners, is in danger of going under. Some neighbors have been in touch with super-slippery Bill DeBlasio, who has voiced his support (for what that's worth). There's also a petition in the store that can be signed at any time during opening hours. In the meantime, let me just point out that I have long loved the old school sign. Not sure how old this business is, but, based on the sign, I'd say at least the 1960s. 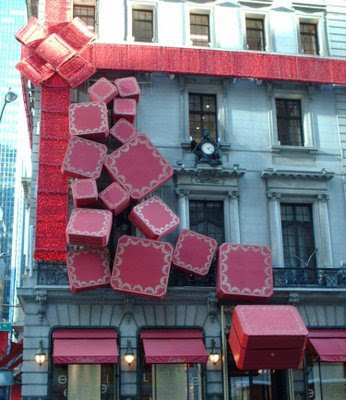 Despite the encroaching Citywide gentrification and homogenization, New York neighborhoods still have their differences, even when it comes the Christmas decorations. 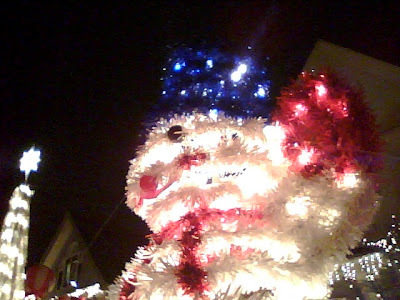 In Dyker Heights, if you'd struck by the holiday mood, you blow $10,000 and erect a giant electric snowman on your yard. In Brooklyn Heights, you adorn your door with a wreath and some classy, traditional evergreen boughs, and make sure your stately tree is visible from the street. 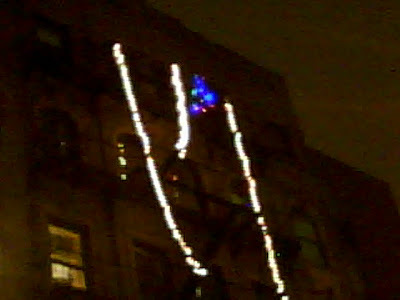 In the East Village, meanwhile, you buy a few strings of lights at the local Duane Reade, plug them in the outlet nearest the street and fling them out the window. Job done! 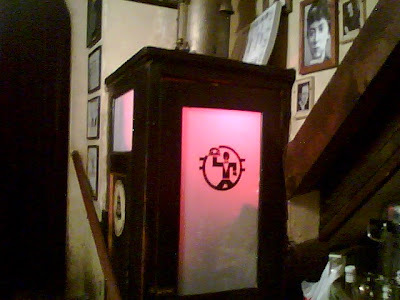 I first noticed this particularly lazy, but charmingly raffish way of decorating back in the late '80s and early '90s, when I lived in the East Village. 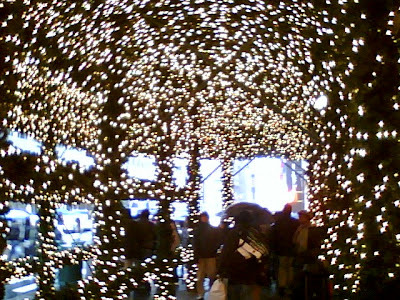 There would be no elaborate looping or draping of lights. The strings would simply dangle out the window, reaching down two or three stories. When there were several such strings on one block, the effect would be strangely magical, as if a row of buildings was being pelted with neon rain. I reasoned that this was the work of East Village hipsters, who felt a slight urge to get into the holiday groove, but didn't want to exert themselves too much, as that would be highly uncool. Last night, I was happy to see that this peculiar tradition had persisted. 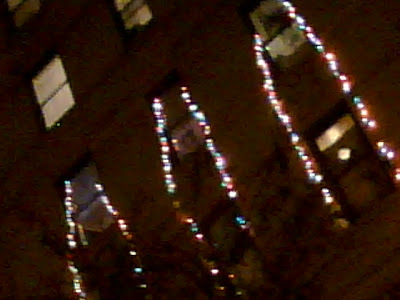 I spotted several tenements so adorned. The strings pictured here were on E. 3rd and E. 4th Streets. 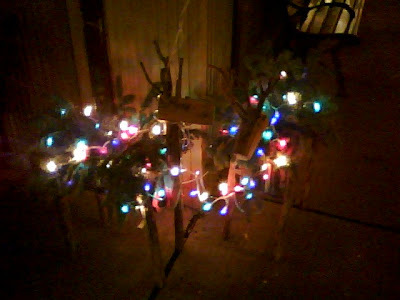 I don't know, but I just love those Christmas-light strewn wooden reindeer outside Mazzola Bakery on Henry and Union Streets. So sue me. Here's a picture. 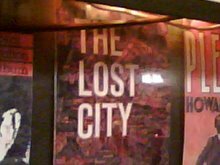 AM New York has a nice piece today titles "Endangered New York: 10 (more) to Save," in which the paper makes the case for some City treasures in danger of being lost to the City Hall-Developers-Corporations cabal. Peg Breen, president of the New York Landmarks Conservancy says, "People throughout the city are slightly uneasy about the pace of change and the loss of familiar things in their neighborhoods. We're in a period where real-estate interests have clearly dominated. [Development] is not bad, but what makes the city unique and a joy to live in are the layers of history--you don't want to lose a sense of place." Well put, Peg. Wonder if anybody's listening out there. Among the buildings AMNY stumps for are Admiral's Row, the Donnell Library Center, George Washington Bridge Bus Station, and the Hotel Pennsylvania. Even Macy's flagship building in Herald Square, which, unthinkably, is endangered, should the department store embrace the utterly boneheaded idea to clear out in favor of the proposed Penn Station Mall. I'd argue that the Macy's Building is 75 percent of the reason why any New Yorkers patronize that store; without it, Macy's is just another run-of-the-mill retail concern; with it, it's historic, grand and special. Three cheers for AM New York. Now, why can't this sort of advocacy journalism be practiced where it would actually make a difference—at, say, the New York Times. The Times has been completely out-to-lunch on what I and many others consider THE STORY of the past ten years: the reshaping, denuding and bankrupting of New York City's cultural, architectural, emotional and physical soul. I went to Macy's last night because I was in the area and I heard they were keeping late hours this year, so I thought I could get some shopping done. Of course, the place drove me near mad, with its aisles of mundane merchandise and its lackadaisical sales staff. However, the visit was worth it for the escalators. 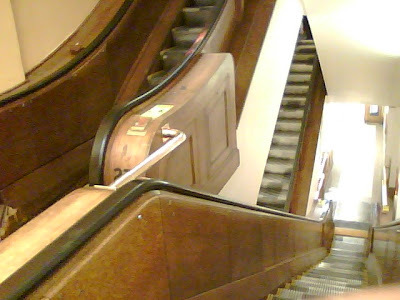 Macy's possesses what are probably the only wooden escalators left in the City. They have wooden walls and many still have wooden tracks on the steps. Something about all that wood makes them emit a soothing clickety-clack that's quite missing from the usual steel-escalator experience. It's very soothing, something that could likely put a baby to sleep after a few floors. I'm capable of getting misty-eyed about almost any neighborhood in the City. But, I'm sorry: Woodside, Queens, has almost nothing to recommend it. I've explored the area thoroughly and found only two things of note, other than the elevated subway tracks, which give the place an atmospheric, film noir vibe that it doesn't really merit. Those two are Donovan's, the Irish pub which serves up great ambiance and a nice burger, and the Station Cafe, and out-and-out dive that is almost unmatched in the City in its unironic dinginess and destitution. Its name is derived from its location, almost dead center under the intersection of the 7 line 61st Street stop and the Long Island Railroad station. In an interview, a bartender said the place was founded about 80 years ago, which would mean it started up in the heart of Prohibition. There's a story there. The squat building is one story tall and coated in brick-red metal. The awning over the central door has been losing its battle with gravity for years, but refuses to hit the ground. 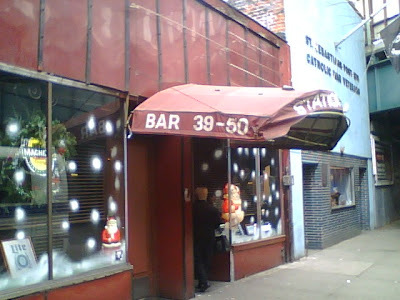 I've often passed the tavern at 9 AM, so I know it opens early, and its patrons take good advantage of its early hours. Barflies gather just after breakfast, nursing weak beers or whiskey, and presenting drawn, resigned faces to the world. Actually drinking in the place is fairly unsettling Eugene O'Neill kind of experience (I've tried once or twice). 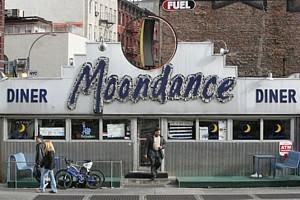 It could be the place where Dana Andrews spends his last nickel in a 1940s, postwar flick. There's a pool table, seldom used, and a couple windows, shaded by Venetian blinds, through which escape a few sad, dim rays of sunshine. But I have to hand it to a bar that is a bar, and not an idea of a bar. I also applaud the place's spirit. Though life and time stands still inside the Station Cafe, they don't forget the holidays. Decorations go up like clockwork after Thanksgiving—evidence that the management utilizes the calendar. Merry Christmas, boys! Have one on me. 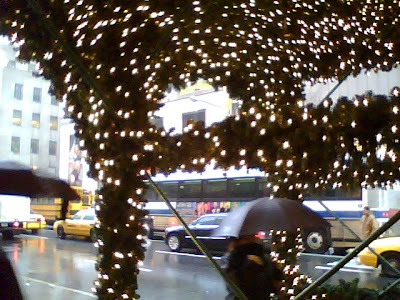 Go to almost any neighborhood in New York City this time of year and the main drag will be garlanded with Christmas lights, hanging over the street like a luminescent canopy. But on Court Street, the primary artery of Cobble Hill and Carroll Gardens, you'll find two, count 'em, two strands of holiday lights, both on the block between Union and President. The rest of the strip? Dark. 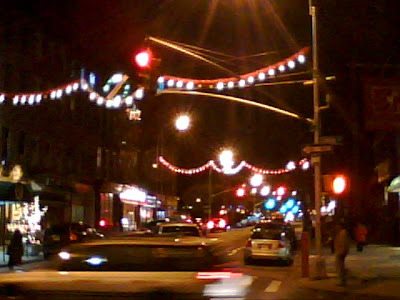 In the 1990s, when I moved to Carroll Gardens, the whole of Court Street was adorned with Christmas lights. This continued for a number of years until one year—gone! Nothing. I asked around. Storekeepers told me that the lights were paid for by the area merchants and that year not enough of them would kick in the dough to help foot the bill. The circumstances went back and force after that: sometimes they'd be lights, sometimes not. Lately, it's not. The Court Street BID (if there is such a thing) is a chintzy outfit. 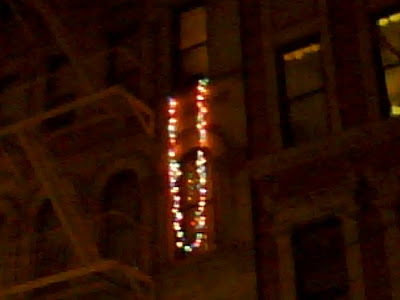 I have never seen an isolated block of Christmas lights, however. It's peculiar, almost anarchic. I asked around. Marco Polo Restaurant laid claim to the strand near them. The other appears to be the work of Esposito Pork Store. "It was like pulling teeth," said the man behind the counter, when asked about the lights. The other merchants wouldn't give a cent. I felt for the guy. The subject was obviously a sore one for him. So here's to the spirit of Court Street between Union and President! That block has its heart in the right place. As for the rest of the street, well, you know now what your New Year's Resolution ought to be. 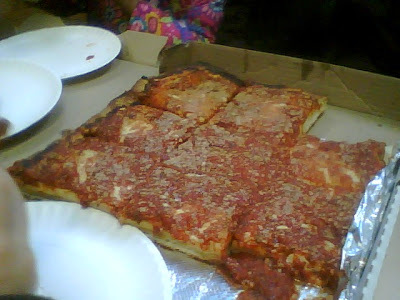 How do you know Bensonhurst's classic drive-in L&B Spumoni Gardens does a bang-up business in its patented retangular parmesan pizzas? When you walk in on a cold Saturday night and order one, the pizzaioli doesn't get to work pounding the dough. He just turns around, grabs a box resting above the pizza oven and hands it to you. And it's got a pizza inside it! And it's still hot!! These guys are ready with dozens of freshly made pizza, and they know they're going to sell them within minutes of their coming out of the oven. That's a business, buddy! The slices were, as usual, light, tangy, zesty and addictive. I inhaled three pieces in five minutes. 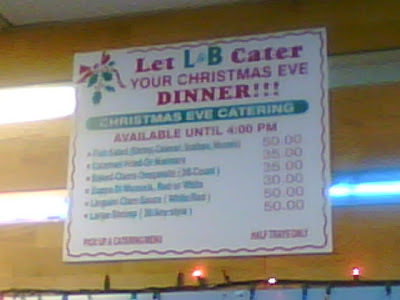 I was amused to see a sign on the back wall advertising L&B's willingness to cater your Christmas dinner. Who's lazy enough to rely on take-out pizza and heros for their holiday feast? The guy behind the counter, however, said they do brisk business. OK. If it makes you merry, who am I to say no? I ask you: what is wrong with this newsstand? 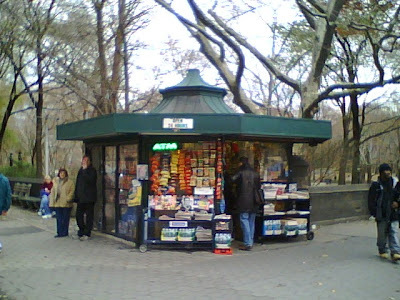 It's pleasing in shape and appearance, blends in with Central Park behind it, you can go inside, it's open 24 hours and it's got an ATM! It's a masterpiece! And you know what? I bet the lock works and it doesn't leak. Why would you want to replace it with one of those Cemusa crap jobs? Why I ask you? Oh, I know why. Because there's no place to advertise on this one! The MTA and the Department of Building are not known for being particularly receptive or sympathetic to the needs of the people of this city, unless your name is Robert Scarano or something. Now, it's slowly becoming clear that they're not only unresponsive to public outcry, but actually hostile toward it. Queens Crap reports today that an e-mail he sent to DOB commissioner Patricia Lancaster—who, it was revealed last week, is fond of cutting under-the-table deals with scofflaw developers—provoked a response from a New York City Police detective. Now, admittedly, QC's missive was a big unhinged; exclamation points and capital letters. But, still, it shows where Lancaster's priorities are. Consider complaint? No. Call cops? Yes. Meanwhile, The Daily News reports what we all knew long ago: the MTA is wasteful, corrupt and self-rewarding. The agency has several presidents instead of one, and each gets thousands of dollars in housing allowances "even though they're in easy commuting distance from their jobs." The director of the MTA and the seven presidents of the agencies within its purview get more than $1.8 million in salary and deferred compensation. There are many redundant jobs, and the MTA plans to actually add more positions in the future. All at a time when the agency is forcing yet another fare hike on the public. The News also found a total 112 MTA lawyers with a $12 million payroll. Guess they need all those sharks to fend off the public's constant attacks on the agency's sovereignty. It's a blistering report. Now, let's see if anything happens. Bloomberg? Spitzer? The Year of Our Mayor 2007 isn't quite over yet, but I figure the jackasses who run this City (developers, real estate agents, corporate CEOs who live far away and the backroom City Hall politicians they own) will be taking a break from their wrecking-ball shenanigans for the holidays. So, it's as good a time as any to toll the bell on the priceless and irreplaceable landmarks and businesses that were lost to good ol', sad ol' New Amsterdam during the previous, grievous nine months (the second straight year in which this blog has had to do what no one in power has the time or inclination to: NOTICE!). The Second Avenue Deli reopened on 33rd Street. Depending on how you look at it, this year was even worse that last year. But that's sort of like comparing the Great San Francisco Earthquake to the Great San Francisco Fire. What's the point? It's all of a piece and it's all bad. A adventurous friend and I, along with our assorted children, decided to hop in her mini-van the other night to explore Dyker Heights, the Brooklyn neighborhood so beloved by local news stations this time of year. 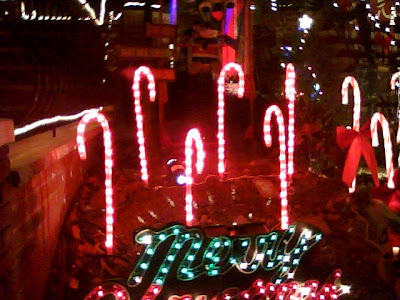 As you may or may not know, Dyker Heights has been bit by the holiday cheer bug for many years now. Locals decorate their domiciles to such an extent that Con Ed sets upon gnawing its fingernails and Disney execs send down their interns to take notes. As Christmas approaches, the streets in the 80s between 12th and 13th avenues become clogged with gawkers. We were among those rubberneckers until the kids insisted we park the van, get out and take a closer look. And so we did, and what we saw! One lawn adorned with king-sized inflated likenesses of Mickey Mouse, Tweety Bird, Scooby-Doo and SpongeBob, who, for some reason, have something to do with Christmas. A snowman made entirely of lights and as big as a house. Skating tots who endlessly spin on their platforms. 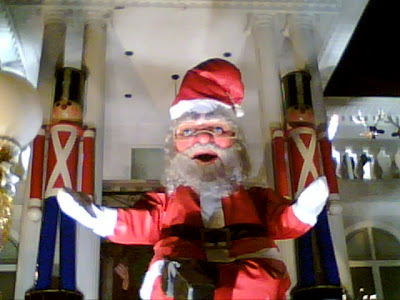 And, as part of an elaborate decorating scheme entitled toyland, a Santa figure so big as to rank as a South Seas godhead. Scary, he was. The wife suggested we offer a sacrifice. The automated reindeer on the balcony, rearing up violently, appeared to agree. 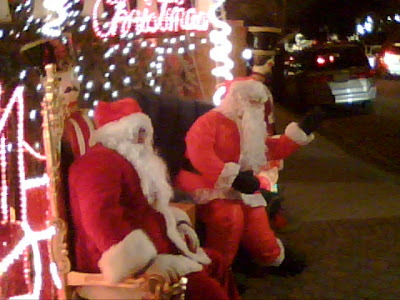 Other houses offered live, full-blooded Santa stand-ins, who handed out toys and treats. 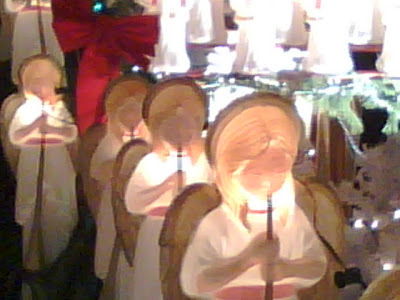 One such was seated, eerily, next to a life-size Santa doll of similar appearance. It was hard to tell the two apart. While wifey and I were doping the thing out, a tall, red, furry figure lumbered down the driveway with two plastic buckets. Egad! It was Elmo! And he was headed our way! 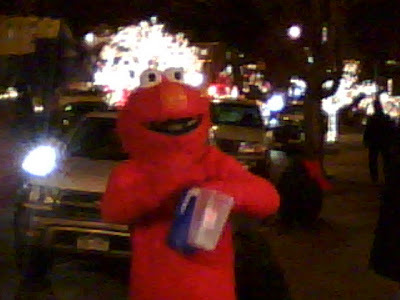 Luckily, Elmo passed us by. His footing was uncertain and his intentions were unclear. He may have been collecting funds for charity, or to pay the electric bill. Either way, Elmo's World was never this bizarre. Also collecting funds was a man in a very sad-looking snowman costume. He was standing with his plastic bucket not on the sidewalk but in the middle of the street, which made him seem vaguely homeless. In this same area was a suspicious figure trading Santa hats and light sabers from the back of his open van. WTF? On one corner, a vast display was still under construction. Two men were busy hanging lights on trees. Judging by the nearby van, they were from DiMeglio Decorations, an operation whose logo features a particularly evil looking elf. Several of the layouts, in fact, appeared to be the work of professionals, not the people who lived in the house in question. Some lawns bore signs advertising the company at work. B & R Christmas Decorators was one I saw more than once. Some houses had no decorations whatsoever. What Grinches these people much feel in such environs. 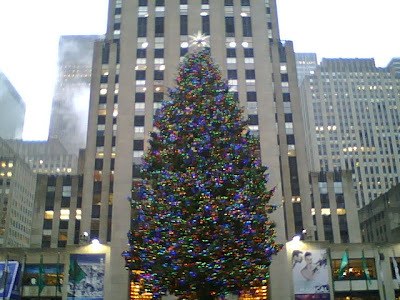 Am I imagining things, or did the Rockefeller Center tree people start adding blue lights this year? I may be misremembering, but I don't recall this color is previous lighting schemes. Either way, I like it. It somehow adds to the cheerfulness of the tree and the beauty of its appearance. You get all excited about the possibility of knocking down some historic, one-of-a-king buildings so you can erect a nifty supermarket and a really neat parking lot next to it and then some assholes from Washington tell you the damn buildings are actually worth preserving! Well, if that ain't a kick in the teeth. That's what happens this week when a federal study commissioned by the National Guard to access the state of the 100-plus-year-old group of military mansions inside the Brooklyn Navy Yard known as Admiral's Row didn't conclude, "Hey, go ahead! Knock 'em down!," but instead said eight of the ten structures were sound and retained "an extremely high level of integrity." $20 million and they'll look good as new. "But not as good as a new parking lot!" screamed the mad-as-a-wet-hen Navy Yard officials who want the buildings, and their rich history, gone yesterday. Restore the handsome things!? We don't want the property if we have to do that!! We likem wreckem ball. "If the federal government...requires that some or all of these structures be rebuilt from the ground up...neither the City of New York or the [Brooklyn Navy Yard Development Corp.] are interested in acquiring and developing the site and it will continue to lay fallow for years to come," wrote Navy Yard Development Corp. President Andrew Kimball yesterday in response to the report, according to The Daily News. The final recommendations of the report, which the City must abide by, are still to come. Any dope—any federal dope, it turns out—can see Admiral's Row deserved landmark status. But for this temporary snafu alone, I think the Army Corps of Engineers. I love to see City officials throw hissyfits when they don't get the rubber stamp they've been promised. 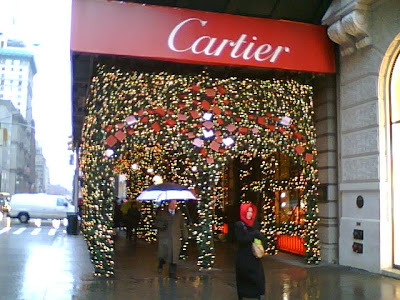 Cartier knows how to make the best of a bad situation. This year, being encumbered by scaffolding, the jewel dealers put on their thinking cap and found a way to turn lemons into lemonade. The company has wrapped up every last yard of metal scaffolding in evergreens and white lights, creating a dizzying tunnel of swirling holiday cheer on the stretch of sidewalk outside its building. Just step inside it and see it you don't feel like you've entered a yuletide funhouse. It says "Laundry." 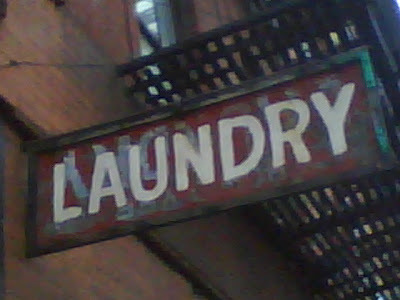 The sign at the laundry says "Laundry." Look closely and you'll see that behind the word "Laundry," upsidedown, is also the word "Laundry." Way to recycle a sign. 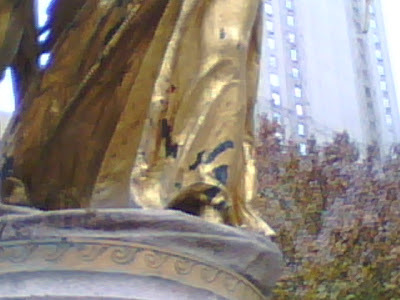 What's happened to the Augustus Saint-Gaudens statue of General Sherman in Manhattan's Grand Army Plaza? 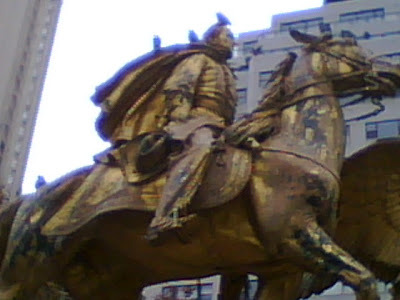 Just 17 years ago, back in 1990—the equestrian statue, which was dedicated in 1903 and was the sculptor's last major work—was given a fresh coat of gold. Now, look at it. Is gilt supposed to erode this quickly. 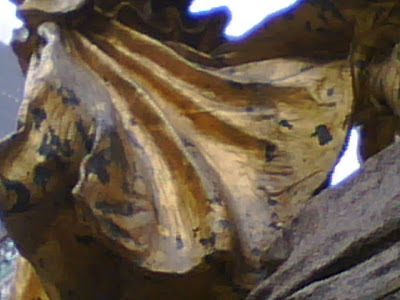 I remember sitting under the statue just a few years ago and basking in the still-brilliant gilding. Now it looks like it's moulting. Even from a distance, it frankly looks like crap. Whole chunks of gold have fallen off both the horse and the angel that leads Sherman. When the restoration was completed, a lot of people complained it was too brilliant and gaudy, that it was vulgar. But that look was far preferably to this. The Parks Department website says that site was given an inspection in April and found to be "acceptable."